The Move were perhaps, after The Beatles, our most consistently great purveyors of late-60s pop. However the Black Country barnstormers are still overlooked and unfairly dismissed by many, but hopefully the release next week (27th October) of The Move Anthology 1966-1972 will help resolve the situation. The 4CD boxset contains 62 tracks and over 3 hours of music, overflowing with the hits, outtakes, demos and alternative versions you would expect. It also features an entire 1968 Marquee show. The full-colour 72-page booklet contains rare photos and memorabilia, and an extensive 10,000-word Move history essay featuring band interviews and complete track-by-track info. In addition the first 5,000 copies sold come with a special double-sided poster and five reproduction postcards featuring each of the original members. 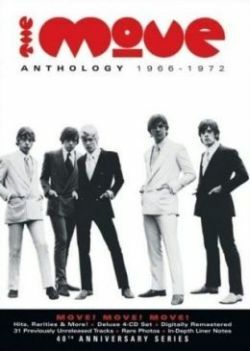 Anthology 1966-1972 is out Monday and available from Amazon here.